All Photos by Jamie Anton (BlueManual6wagon). Art by Jason Torchinsky. Jalopnik reader named Jamie Anton sent just me photos of an awesome trading card deck he picked up while studying at General Motors Institute of Technology (now Kettering). Each card shows a picture of an engine or transmission, and the back of each is filled with interesting factoids like bore, stroke, firing order, gear ratios and assembly location. These may be the nerdiest car-related trading cards ever. 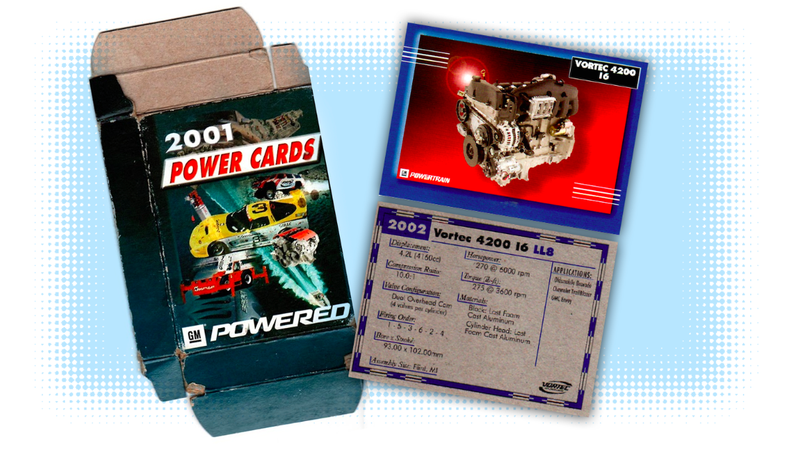 Jamie (BlueManual6wagon on Kinja), who was instrumental in helping me fix my 1986 Jeep Grand Wagoneer this past spring, says he’s not too sure how he and his buddies at GMI picked up these 2001 “Power Cards” decks, but he guesses that some GM intern likely got ahold of a few and brought them back to college. My coworker Jason and I think it’s more likely these were part of some sort of GM promotion. Perhaps they were given to dealerships to distribute to customers, or maybe these cards were handed out to folks attending the 2001 Detroit Auto Show? There’s the troubled VTi continuously variable transmission out of the Saturn Vue, the 4T40E out of the lovely Oldsmobile Alero, and the Chevrolet Corvette’s 4L60-E (which, oddly is labeled as a “front-wheel drive” trans). I would love to own cards like this. I’d much rather flip through some trading cards than have to google search to figure out which one of GM’s dozens of four-speed automatic variants was bolted behind the Saturn L-Series’ four-cylinder engine (whatever variant of GM’s many four-bangers was in that car). Better yet, it’d be best to just study these cards and memorize these by heart. It’d be the ultimate car show party trick. Early 2000s GMs Are Cool. Sometimes.